Thank you to Chris who sent me a copy of the England Commercial Register scam letter (a copy of which is below), relating to the Commercial Register scam. 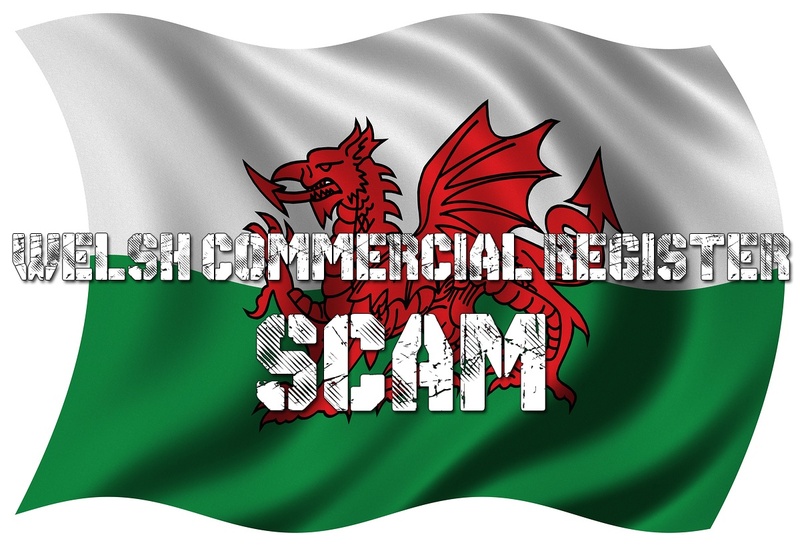 This scam has many different guises (see Scottish Commercial Register scam and England Commercial Register Scam) but the way it works is almost identical. Basically, the people behind the England Commercial Register scam are based in Spain and send a letter to companies (usually sole traders and small businesses) hoodwinking people into signing a letter which looks official. Once you’ve signed, they send you a bill for advertising on their websites. First of all, let’s take a look at the general layout of the letter. It certainly attempts to look official. Let’s have a look at some of the points in more detail. C – ‘Removal of your Company Details’ suggests that you have something to lose. Actually, you only have a lot of time to waste by completely the form! E – The final paragraph, which contains confirmation that this is a private company, is in the middle of the paragraph. It also confirms that Direct Publisher at targeting businesses and not private individuals. This is because Direct Publisher know that the law provides much more protection to private individuals rather than businesses. Note: there has been some suggestion that you could send the pre-addressed envelope back to Direct Publisher full of rubbish. Don’t waste your time as Royal Mail have confirmed they won’t forward it on. @ritchiiiiie The item would be returned to sender or if not return address present would be disposed of if nothing of value. We just receivced the same letter, S@!t myself when I unopened at first! We received the same letter. So glad I googled it. It looks official but there are spelling/grammatical errors, the best of which is the signature Chef editor! I have put it in the bin! Sadly, there are many who haven’t. Thanks for sharing your experience. Point is that people still fall for these scams in every guise. I get fed up advising my clients of these and just cannot believe how people sign forms – send them off – and then ask someone like myself what it was for afterwards. thank you for informing me about this scam. what now i am going to do is return the post paid envelop with a lot of junk inside to also increase the weight and the company gets surcharged by the post office. A few years ago we nearly fell for the same trick with ‘European City Guide’. Great idea Raj, one full envelope on it’s way to France. Had one too. Glad I found this site, although wouldn’t have replied as it looked fishy anyway. Thanks to all for the info …. just filled mine with shredded paper !! Just do as I’ve done… put a post it note in the return envelope saying ‘Ho! Ho! Happy Christmas’ and put it back in the post to them. Isn’t it nice to speard some goodwill? Just received this very letter today for our business. Noticed the reply envelop had a Spanish address and so got straight onto Google. Read to the very bottom and if signed and returned to them we would have agreed to pay up almost £1000 p.a! Thanks Steve, I have done exactly that same as you, ho ho ho! Great idea Raj – I have just done the same. Managed to get the envelope weight up to 238g! Thanks for the info which was as I imagined. The idiots just sent me the same letter. Did not bother to read but googled (as I always do with things like this). Thanks for this site and info. Advice taken Raj. Looking for something small and heavy to include. It will come to me shortly. Kate put some blue tac and paper clips in it, that should weight it down a bit! I’m doing exactly the same with the letter I’ve received today. 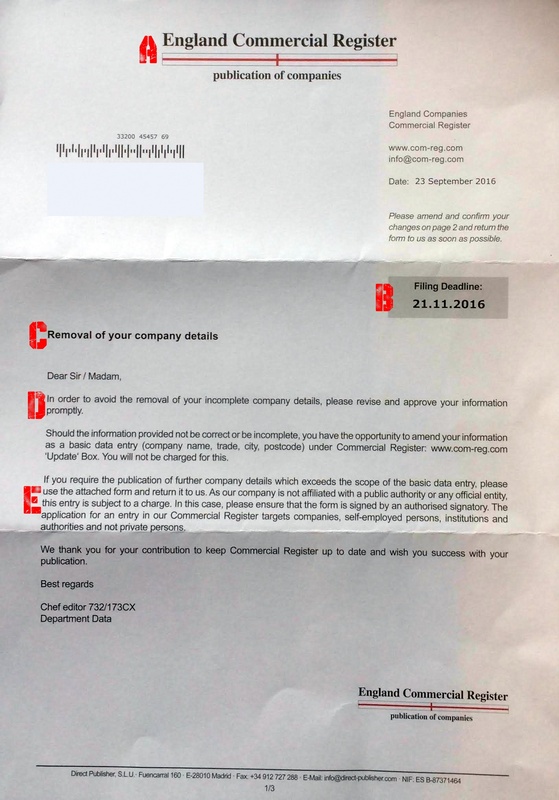 I had not heard of the “England Commercial Register” so when we got the letter I Googles it and up came your Scam information. Thank you for saving us from this scam. You lot are so mean. I just sent a nice friendly printed note telling them to go forth and multiply, followed by Happy Christmas and few kisses. I also bulked it up with some junk mail. I emptied my hole-punch clippings into the pre-paid envelope also. So when they pull out the junk mail it will be accompanied by a nice seasonal shower! Ho ho ho. Thank you for posting this. Had mine today. I have tweeted to inform others too. Just received one today, fortunately I have been the recipient of such letters in various guises over the years (nearly hoodwinked the first time) it looks dodgy to be honest – it went straight in the bin. Received this letter today with the deadline being January 17. Thought it looked a bit suspect as I deal with everything that comes from HMRC/Companies House/Government. This just didn’t look right. Just want to say thanks for having this information available as it will surely stop others falling into the trap! Sand the same envelop back after filling with some heavy junk stuff so the scammer should pay some cost and royal mail should make some money. Always put something heavy in the prepaid envelope and send it back to them. I received this today too. So I sent my envelope back with some used coffee grinds in a zip lock bag. Hope thay choke on it!!! I’ve been caught by this company now they are sending me demands for payment. I only wish I’d seen all this before I signed and returned the form. I’ve no intension of paying plus I couldn’t afford it anyway. I used sellotape to attach their reply paid envelope to a old hardback book I was going to throw away. Should be nice and expensive! Yes, just received exact same letter. looked very dubious with it signed by Chef editor 732/173CX, so googled the company and found out the scam. Received this myself too…but missed a trick – I should have put a load of weighty rubbish in the pre-paid envelope and sent it back to them! Little point I’m afraid – Royal Mail won’t send it. We have also received one. I remember something very similar many years ago ago going back to the late 90’s where I signed something and got lots of nasty letters demanding money. They close down and keep popping up. I don’t know how they are allowed to operate. If you receive do please report to actionfraud.police.co.uk which covers postal phishing. The more who do the more likely they are to do something about it. I will also send back with rude message and weighted junk. I will report this now. Good shout! We’ve received one of these letters too. Thought it seemed fishy, so googled it. Glad I did. Thanks for the heads up. Ha, it still says ‘Chef Editor’. Can’t believe I didn’t pick up on that. Do not be fooled! Chuck, it out. I’ve just received this letter too. I intend on posting back to them a blank folded card with lots of nice sparkly glitter inside! We estimate that this will create around £3,000 of cost incurred. Just a bit of harmless fun eh? Just received a “similar” one. Looks like they’ve changed some of the details. Now just “Commercial Register” similar body text, filing deadline, etc. No signature as it suggests it has been processed electronically. Still Direct Publisher and still based in Madrid. just received a letter from the Commercial register today thought it was a scam straight away but i will send it back with a load of rubbish in. I stupidly filled this in and sent it back. I have now received an invoice. If this is a scam can i just never pay the money? Personally I haven’t (and won’t) pay. What you do is up to you. But there is no record of anyone ever being taken to court over this. Hi thank you for posting this I found it very useful too after also receiving such a letter. Although they have changed the letter head slightly as well as the wording. I thought it strange as I have never had a form like this in all my time in business either. Hence googling the authenticity. 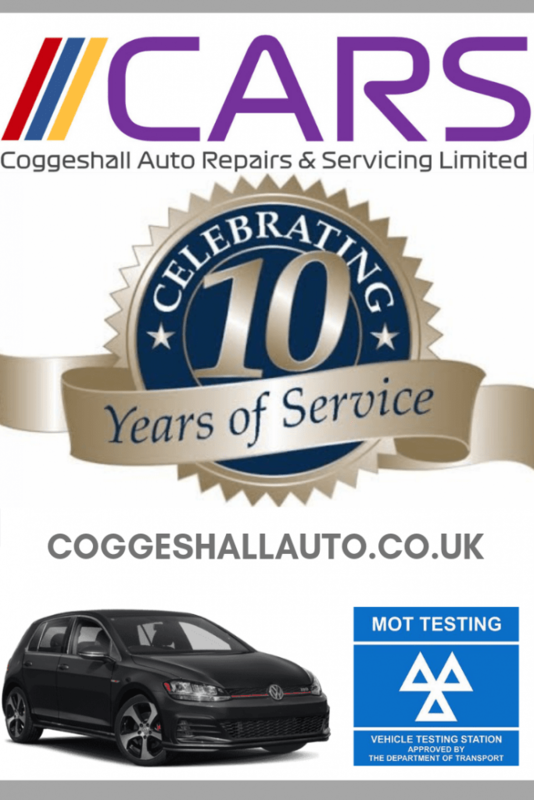 Also reading the small print on the form it does state you are entering a contract for 3 years for them to advertise for you at a cost of £863 + VAT per year!!! outrageous. Can we not report these people??? have reported them to the spanish consumers board – doubt if it will get anywhere ? http://www.ukecc-services.net/UnionofConsumersinSpain.cfm also to uk trading standards as i am fed up with them !! I have been receiving these letters now since February 2017. It stopped for a while, now recently they have started chasing for this years payment. I just ignore the letters as advised, and will not pay a penny, they do leave you alone after a while.